How to Fix Move to iOS Taking Forever - iMobie Inc.
Move to iOS taking forever? This post will show you how to fix the issue of move to iOS taking too long. This amazing Android to iOS data transfer tool could help you transfer data from Android to iOS quickly and easily. Download it now and have a try. Q: I downloaded Move to iOS app and managed to start transfer data from my old Android phone to new iPhone. However, a few hours passed, ONLY 14% of the data are transferred, it seems like move to iOS takes forever. How long does move to iOS take? How to make Move to iOS faster? Frankly, how long move to iOS takes very depends on the size of the data you want to transfer and the WiFi connection. If there are too many data you want to transfer or the WiFi connection is unstable, it is quite normal that the transferring process may take a few hours. However, sometimes the transferring process is just extremely slow and it seems that move to iOS takes forever. Under this circumstance, you will need some tricks to speed up transferring. Now, follow us and get some efficient fixes for Move to iOS taking too long. Like mentioned above, WiFi connection plays a vital role in data transferring. Just visit a website on another device under the same WiFi and see if the WiFi connection is good. Please note that while using Move to iOS, make sure both of your devices are under the same WiFi otherwise no data can be transferred via Move to iOS app. Unnecessary data generate through everyday usage. So, before using Move to iOS app to transfer data, do clean your Android phone so that you don't have to wait for Move to iOS app transferring unnecessary data. If move to iOS still takes too long after you tried the two methods above, please restart the transferring process. It is possible that after restarting, transferring speed might improve considerably. The above three methods would work for majority of people. However, if these methods don't work for you or you really need finish move to iOS process within one hour, we recommend you a free and powerful Move to iOS alternative - AnyTrans for iOS. - High Transfer Speed. It would only take 5 minutes to transfer a few gigabytes of data with this powerful Android to iOS data transfer tool. - More Data Can Be Transferred. What Move to iOS app can transfer is quite limited. With AnyTrans for iOS, you can transfer data like music, videos from Android to iOS that Move to iOS can't transfer. - Integrity of Data. 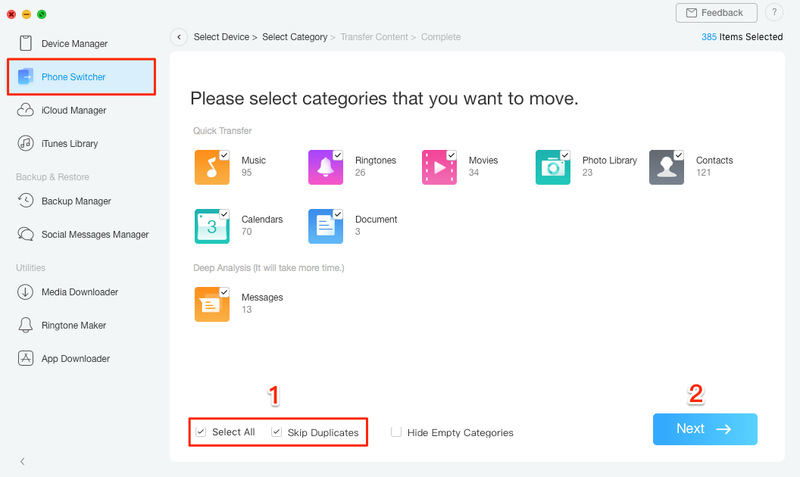 How to use Move to iOS app is not confusing, but it is just not easy enough. With this powerful Android to iOS data transfer tool, you can finish the transfer process within a few clicks. - No Restrictions on Devices. As is known to all, Move to iOS app requires rooted Android phone and unactivated iOS devices. AnyTrans for iOS could directly transfer data between Android phone and iOS device without such restrictions. While using Move to iOS app, you may encounter more issues like Move to iOS get no code, Move to iOS stuck on transferring, Move to iOS WiFi disconnecting to device. If you are encountering one of the issues, please refer to other pages to get fixes. That's all for how to fix Move to iOS taking too long. Hopefully you have now successfully transferred data from Andriod to iOS. If you find this post helpful, please share it to help more people. By the way, don't forget to give this powerful Move to iOS alternative a try!